Mississippi Advance Health Care Directive (Medical POA & Living Will), also known as an ‘Advance Health Care Directive’, is a two-part form where you can either name a person to be your health care agent and make decisions for you, set forth your health care preferences for your medical providers or both. This type of form is useful when you find yourself unable to communicate due to a debilitating disease or accident and you have someone in place who can take care of you and make sure your wishes are carried out. Durable Power of Attorney – Enables you to appoint a financial representative to make decisions on your behalf. Their authority will endure post-incapacitation. 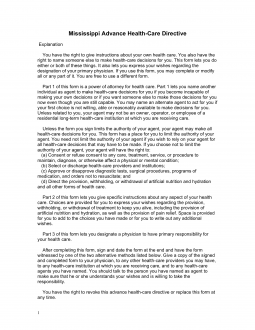 Item 2 will provide the declaration statement required by the Principal to provide the Health Care Agent(s) named in this form with the Power to make “…all Health-Care Decisions” on his or her behalf. If, however, the Principal has certain exceptions, concerns, or preferences, they should be detailed on the blank lines below the words “(2) Agent’s Authority.” If necessary, you may add more lines or continue on an attachment to provide a Full Report. Item 3 will seek to define when the Health Care Agent’s Principal Decision Making Power goes into Effect. By default, they will go into Effect when/if the Principal Patient is declared unable to communicate effectively or to make Health Care Decisions by his or her Primary Physician. If the Principal Patient prefers the Powers in this document to become effective immediately, he or she must mark the bracket box in Item 3 between the words “If I Mark This Box” and “My Agent’s Authority…” The next two items will further define some Principal Preferences. Item 4 will grant the Health Care Agent to make Decisions based on Principal Preferences if the current situation was not covered. Item 5 will nominate the Health Care Agent(s) named above as Guardian(s) to his or her estate and person if the courts deem one is necessary. Any part of these statements, or their entirety, may be deleted or crossed out to exclude them from being included in the Principal Decision-Making Powers delivered to the Health Care Agent. Part 2 will document the Principal Preferences the Health Care Agent (and all involved with the Principal Patient’s Health Care) should be aware of as the Principal’s Instructions. Item 6 will begin this report by requesting one of two checkboxes to be marked to indicate the Principal’s feeling regarding “End-of-Life Decisions.” If the Principal prefers not to have his or her life prolonged when faced with an incurable/irreversible condition that is terminal, being permanently unconscious, or a condition whose risks/burden of medical Treatment will “Outweigh Expected Benefits,” then he or she should mark the checkbox labeled “(a) Choice Not To Prolong Life.” However, if the Principal wishes to have his or her life Prolonged when faced with such a condition then, he or she should mark the checkbox “(b) Choice TO Prolong Life.” In Item 7, the Principal may choose to receive Artificial Nutrition and Hydration (regardless of the choice he or she made in Item 6) when necessary by marking the box between the words “If I Mark This Box” and “Artificial Nutrition…” Item 8 shall direct that “Relief From Pain” should be provided even if it may cause the Principal Patient to die prematurely. The Principal may have exceptions to this. If so, these should be recorded on the blank lines provided in this item. The Principal may wish to provide additional instructions or details to the Health Care Directive being documented there. If so, use the blank lines in Item 9 to document such additional items. Anything recorded here should be a complete account of Principal Preferences, so if there is not enough room, you may continue on an attachment or add more lines to this document. The Principal will need to sign this form to finalize it properly. Two columns below the words “(12) Signatures: Sign And Date The Form Here” have been provided. In the column on the left, the Principal must enter the Date he or she signs this form and his or her Full Address. Then in the column on the right, the Principal must sign and print his or her Name on the two blank spaces provided. This form must be signed by the Principal in order for it to be Effective. This signature must be adequately substantiated by another party. This may be either two Witnesses or a Notary Public. The Principal may decide to choose the method he or she prefers. If the signing occurs before two Witnesses then each Witness must read the text in “Alternative No. 1,” then provide the Date of Signature, his or her Address, his or her Signature, and his or her Printed Name. There will be two paragraphs so that each Witness will have their own areas.